The five lads of Commander herald themselves as the leaders of the NWOSHM movement (that's New Wave Of Swedish Heavy Metal). Hailing from Gothenburg, Sweden, one would expect their sound to encompass the brutality of the Death Metal genre which that particular Scandinavian locale has become famous for. One couldn't be more wrong, however, as Commander practice a brand of metal very similar to the NWOBHM sound of early Iron Maiden, Saxon, and Judas Priest. 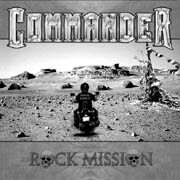 From the very first notes of Rock Mission, Commander's third demo, it's clear what these guys are all about - NWOBHM to the core. Musically the band is more than competent, touching on all of the expected elements of the style. The twin-guitar riffing from Johnny Demon and Dennis Tomb is tight and efficient, while Demon's roller-coaster solos are executed flawlessly. Honcho's bass lines are very prominent, as is the skinwork of Morgan Lawbreaker. Singer Pete Destroyer certainly cannot be accused of belting out the lyrics without emotion. At times sounding very much like Bon Scott of AC/DC, Pete possesses excellent range and can hit the soaring notes without sounding strained. Although I enjoy the music of Commander, I really struggle with the lyrical content. I get just as much of a kick from the occasional "all hail metal" song as the next metalhead, but Rock Mission is essentially a 5-song hymnal to the rock-n-roll lifestyle. Introducing a bit more variety into their songwriting would be a welcome breath of fresh air, but I honestly think the guys of Commander aren't the least bit interested in maturing their sound. Purists of the NWOBHM movement would do well to check this band out.